Rapid bond strength development. 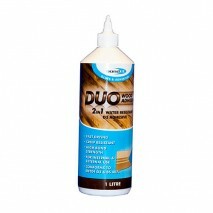 Suitable for hard and soft woods, decorative laminates, chipboard, blockwood and other engineered timber panels. Can be used in applications where joints may be subjected to short term water contact or exposure to high humidity i.e. kitchen work surfaces, window frames, doors and stairs. Suitable for interior and exterior applications.